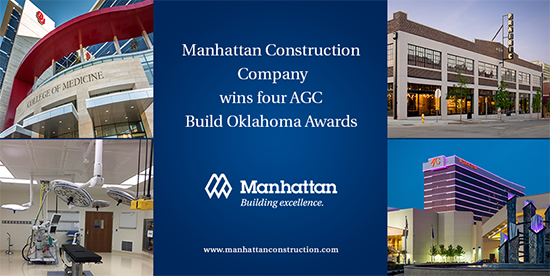 The Associated General Contractors (AGC) of Oklahoma has honored Oklahoma-based Manhattan Construction Company with four Build Oklahoma Awards. Choctaw Nation | Durant Casino & Resort in Durant, Oklahoma in the “Commercial – $50+ Million” category. The project included a new 13-story hotel tower and spa on level one of the tower. The South Casino Expansion included a cinema complex, laser tag, video arcade and a 20-lame bowling alley. The North Expansion consisted of a 3,000-seat theater with a state-of-the-art sound, video and lighting system. Hotel Fox & Universal Ford Building in Tulsa, Oklahoma in the “Historic – Up to $5 Million” category. The renovation of the historic Hotel Fox & Universal Ford Buildings located in the Brady District of downtown Tulsa, consisted of exterior restorations and interior renovations. The build-outs on level one encompassed multiple commercial tenants. Level two build-outs added 31 new apartments and 3,800-square-foot of new office space. The University of Oklahoma (OU) | College of Medicine Academic Office Building in Oklahoma City, Oklahoma in the “Education – $50+ Million” category. The OU Academic Tower is a nine-story building that serves as the new home to several departments and administrative offices of the OU College of Medicine including the Dean’s office staff, the admissions office and office of continuing professional development, and the offices of the departments of medicine, surgery, obstetrics, gynecology, orthopedic surgery, rehabilitation and otolaryngology-head and neck surgery. St. John Broken Arrow Hospital | OR & Radiology in Broken Arrow, Oklahoma in the “Healthcare – $5 to $10 Million” category. For this project, Manhattan added 12,000 square feet and remodeled 5,300 square feet of the existing Broken Arrow hospital. The project was completed in two phases in an active hospital adjacent to operating rooms and inside sterile areas. Unique features such as positive air pressure, medical gas/air and vacuum were a high focus in this critical area. Manhattan team members from each project were presented the honors at the AGC Build Oklahoma 77th Annual Awards Banquet held on Saturday, February 4th at the Embassy Suites Downton in Oklahoma City. Video: Behind the scenes tour of Oklahoma State Capitol basement infrastructure work. VIDEO: Watch this behind the scenes tour with Manhattan Construction Project Manager Andrea Gossard of the infrastructure work taking place in the basement of the Oklahoma State Capitol in Oklahoma City (January 20, 2017). Manhattan Construction Company, and design partner Frankfurt-Short-Bruza, are providing design-build services for the Oklahoma State Capitol Interior Renovation project. You are currently browsing the Manhattan Construction Group blog archives for February, 2017.